Playground disputes: When should you get involved? Kids will be kids and disputes between playmates are bound to erupt. When is it good for a parent to intervene and when is it better to let kids work things out for themselves? It’s a classic playground scenario: Two kids are happily playing in the sandbox when suddenly a toy is stolen and the next thing you know someone is in tears. Children often have a hard time expressing feelings like adults do, which can lead to an eruption of emotions, and sometimes causes kids to react in an aggressive way. It’s important to know when to let your children work out problems on their own, and when to step in. Reinforce good behavior when you see it. If you notice that the kids are sharing well or playing nicely together, let them know that they are doing a great job. This will help them to know what kind of behavior you are expecting so that they can model it in the future. Explain rules before they start playing. Help stop a conflict before it starts by laying out some clear boundaries. Telling kids “everyone must wait for their turn before going down the slide” or “we need to share the toys in the sandbox and make sure everyone gets one” will help them to understand the expectation that they play fairly. Teach them to come to you. Tell your child that if he is overwhelmed or doesn’t know how to handle a situation, he can always come to a trusted adult to help resolve it. Give them the words to identify their feelings. Kids can have a difficult time expressing their emotions. If you help them identify if they are feeling mad or sad or hurt, it can help them to express what they are feeling without having the conflict escalate. Help them understand the other person’s feelings. Help your child develop empathy by asking her what she thinks the other child is feeling, and helping her understand those feelings. Encourage them to think up solutions. Rather than imposing a solution to the dispute, ask the children involved how they would like to resolve it. Often kids will come up with some pretty creative solutions, and they will likely be happier with their own solution than one that a parent comes up with. Intervene when it gets physical. 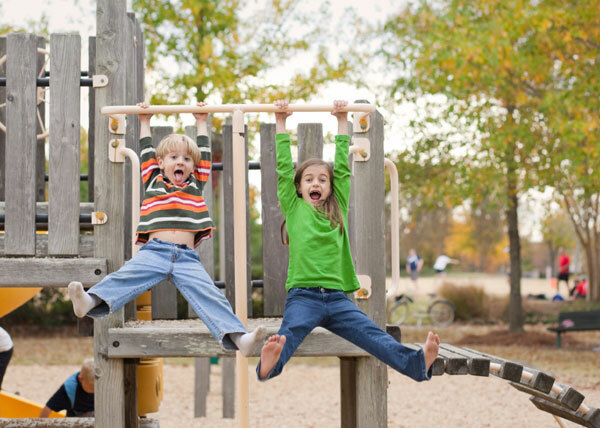 Whenever a playground squabble turns into a physical conflict it is a dangerous situation, and you should get involved and stop the interaction. Step in when emotions are high. If the children involved become overly upset it is best to step in and remove your child from the situation. You can always return to help resolve the conflict once everyone has calmed down. Take charge if you see bullying taking place. There is a big difference between a minor conflict between two children and someone being a bully. If you notice bullying going on, or a group of children picking on another child, it is time to step in and put a stop to that behavior.